Includes 3LUC4-25D electronic ignition conversion kit already installed, ready to replace your worn-out Lucas 4-cylinder, vacuum-advance distributor – Just install distributor, connect the red wire to the coil's positive (+) terminal and the black wire to the coil's negative terminal ( – ), connect vacuum hose to carburetor/throttle body and set the timing - Simple! Zero-maintenance 3LUC4-25D electronic ignition means you won't have to fool with points and timing again – always stays in perfect tune! Distributor is a quality reproduction of the original vacuum-advance Lucas 25D4 vacuum-advance 41199 distributor. This distributor requires a vacuum source from the carburetor or throttle body (when used with fuel injection). 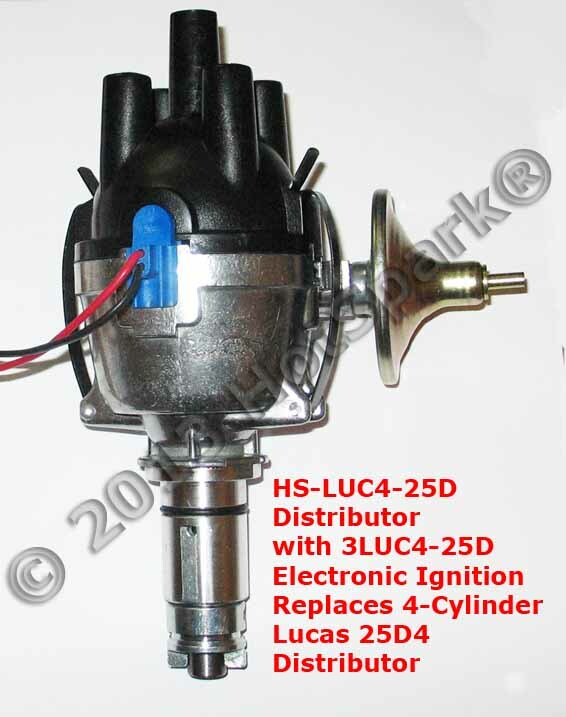 Uses standard Lucas 25D4 distributor cap, rotor, etc. Perfect replacement for worn-out Lucas 23D4 and 25D4 distributors. Remove the old distributor and remove its clamp. Coat the new distributor's shaft and O-Ring with motor oil before sliding it into its hole. Look down into the engine's distributor hole to see how the distributor drive slot is oriented and turn the distributor shaft to match it. You might need to tap the distributor's rim gently to get the O-Ring started into the hole. Work the shaft down all the way, turning the rotor gently, as needed, until the distributor shaft gear settles into its slot and the rotor will no longer turn. Use a stroboscopic timing light. Timing should be set initially to about 24° BTDC at 3,500+ RPM, vacuum hose connected. Firing order is: 1-3-4-2, counter-clockwise (anti-clockwise). The ignition timing should be checked with the engine running, using a stroboscopic timing light, ensuring optimum engine performance and economy. Paint a small line of white paint on both the reference pointer and the appropriate mark on the timing scale to make them more easily seen. With the engine running at the specified speed, the appropriate timing mark should be in line with the reference pointer. Rotate the distributor body clockwise to advance the timing, or counter-clockwise to retard it. Tighten the distributor clamp. Reconnect the vacuum line to the distributor's vacuum canister port. This distributor requires a 12-volt, negative ground (earth) electrical system. Coil: A coil with 3.0 Ohms or more primary resistance must be used. Stock Lucas 3.0+ Ohm points coil OK. The Beru Germany Blue Coil with 3.3 Ohms primary resistance is ideal for use with HotSpark ignition kits. To measure primary resistance: Label and remove all wires to coil ( + or - ). Using a common digital multimeter in the 200 Ω mode, cross the red and black leads of the Ohmmeter. Allow 10 seconds or more for the reading to settle and write down the reading. Still in the 200 Ohm mode, measure between coil’s + and - terminals. Allow a few seconds for the reading to settle, until it stabilizes. Subtract the previous reading, taken with the leads crossed, to compensate for multimeter’s inherent resistance. Do not use a low-resistance coil, such as the MSD or Accel coil; they don’t have enough primary resistance for this application. Test the charging system's maximum voltage: If the charging system voltage, measured at the coil's positive terminal, is more than 14.0 volts at any RPM level, the voltage regulator likely needs replacing or a 1.4 Ohm ballast resistor should be wired between the coil's + terminal and the red HotSpark ignition wire. Too much voltage can damage the ignition module and other electronic components. 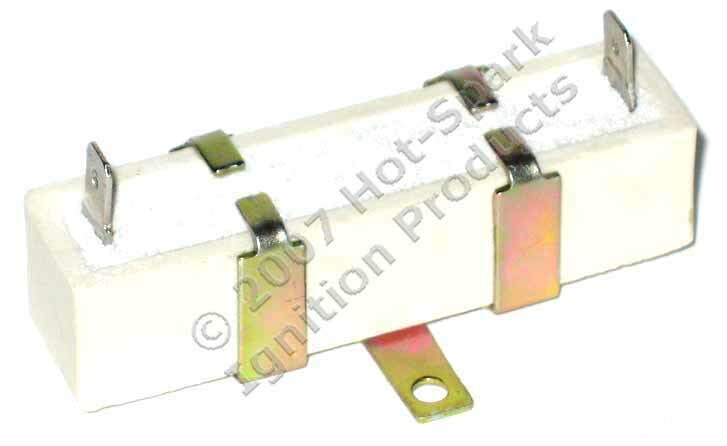 Replacement distributor for Lucas 4-cylinder vacuum-advance distributors. Replaces stock Lucas 4-cylinder distributor. Requires vacuum source from carburetor or throttle body. With 3LUC4-25D electronic ignition installed, instead of points/condenser. Everything you need included - no external ignition box required. 30-32° BTDC @ 3,500+ RPM (full advance), vacuum hose disconnected and plugged. Use stroboscopic timing light, no load on engine (car sitting still). Replaces most 4-cylinder, vacuum-advance Lucas 23D4 and 25D4 distributors. Requires available vacuum source on carburetor or throttle body. Includes heavy-duty red rotor, distributor cap, distributor clamp and everything you need - no external ignition box required. Stock Lucas 3+ Ohm points coil OK. Coil must have 3.0 Ohms or more internal primary resistance. Beru Germany Blue Coil recommended. Replaces most 4-cylinder, vacuum-advance Lucas distributors. We inspect each distributor thoroughly; everything is checked, adjusted, lubricated, etc. We set and test the advance curve of each distributor on a precision distributor testing machine for optimal performance with vehicles using 4-cylinder, vacuum-advance, points-based Lucas distributors.